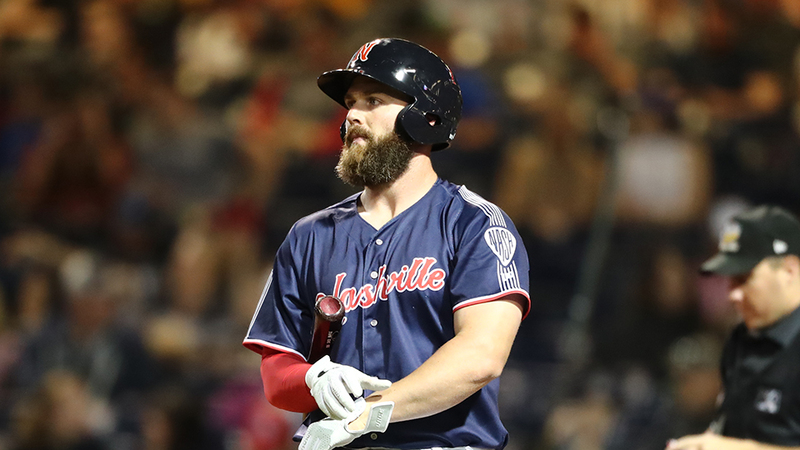 The Nashville Sounds trailed 2-0 when they erupted for seven runs in the eighth inning to lead them to a 7-3 win over the San Antonio Missions Friday night in San Antonio. San Antonio turned to their third reliever of the inning in Taylor Williams. He walked Eli White but it looked like he was going to get out of the inning when Willie Calhoun bounced a ground ball to the right side. Second baseman Mauricio Dubon's throw to first was wild and allowed Granite and Tocci to score to give the Sounds a 3-2 lead. The Sounds took full advantage of the throwing error as Andy Ibanez followed with a run-scoring single to make it a 4-2 game. The knock for Ibanez extended his hitting streak to a team-best six games. Matt Davidson followed with the knockout punch when he launched a three-run home run to right-center field to give the Sounds a 7-2 lead. It was the first home run of the season for the slugger. Nashville's offensive eruption was fitting for starter Richelson Pena who turned in the best performance by a Sounds pitcher in 2019. The right-hander limited San Antonio to two runs on four hits in seven innings. He walked one and struck out six. The lone runs Pena allowed came on a solo homer in the fourth, and an inside-the-park home run by Tyler Saladino in the seventh. Game two of the four-game series is scheduled for Saturday night in San Antonio. Right-hander Phillips Valdez (0-0, 0.00) starts for the Sounds against right-hander Burch Smith (0-0, 0.00) for the Missions. First pitch is scheduled for 7:05 p.m.
- With tonight's 7-3 win, the Sounds improved to 3-6 on the season. - Richelson Pena turned in the longest outing by a Sounds pitcher this year with his 7.0 innings. - Nashville's seven-run eighth inning was their highest scoring inning of the season. Their previous high was the five runs they scored in the second inning Thursday night in Round Rock. - The home run hit by Matt Davidson was his first of the season and 183rd in his career. - Tyler Saladino's inside-the-park homer was the first by a Nashville opponent since Iowa's Taylor Davis hit one at First Tennessee Park on August 20, 2017.